A native of Gallup, New Mexico, Mr. Rosebrough graduated from the University of New Mexico School of Law in 2018. 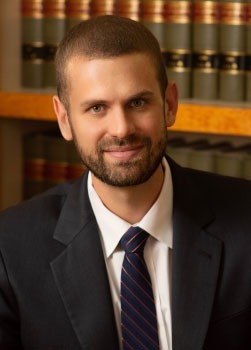 In addition to earning his law degree, Mr. Rosebrough earned a Certificate in Natural Resources and Environmental Law from the University of New Mexico School of Law. He also holds a Master of Public Administration degree and a Bachelor of Arts in Political Science from the University of New Mexico. Mr. Rosebrough is admitted to practice before all New Mexico state courts and the U.S. District Court for the District of New Mexico. Mr. Rosebrough focuses his practice on real estate, title insurance, employment law, water and natural resources law, business law, and general civil litigation. He is currently serving on the Board of Directors for the Natural Resources, Energy, and Environmental Law Section of the State Bar of New Mexico. Prior to law school, Mr. Rosebrough worked for three years as a program administrator at a local nonprofit agency which serves individuals with developmental disabilities. He also served in AmeriCorps NCCC where he spent a year volunteering in several states including Mississippi, Louisiana, Pennsylvania, and Washington D.C. In his spare time, Mr. Rosebrough enjoys photographing New Mexico’s beautiful backcountry, participating in triathlons, and hiking. Mr. Rosebrough is proud to be a third-generation New Mexico attorney following in the footsteps of his father and grandfather.